It was the day I was served with coffee with something that looked like it belonged to my chemistry lab. 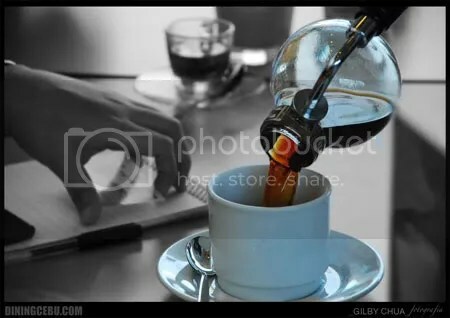 I learned that hot coffee should be drank within five minutes after it was served (but I like stale coffee!). I am not a big coffee drinker, I prefer tea (char! ), but I love the aroma of coffee. Fedge is a witness to my love for its smell. I actually thought of developing coffee-scented car air freshener back in the days when I was a practicing chemist, but somebody beat me to it. It was the day (in recent memory) that I was not tempted to eat any of these sweets. I had enough sugar in my UCC breakfast (review in succeeding posts). 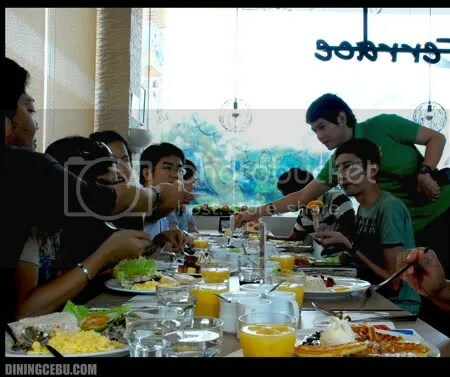 Berg and I got to meet the yuppies of Cebu Bloggers Society, who were there on time. Hope your Sumilon trip was a blast, guys! It was the first time I heard of “designer” uniforms. Behold the UCC staff’s uniform – designed by Rajo Laurel. 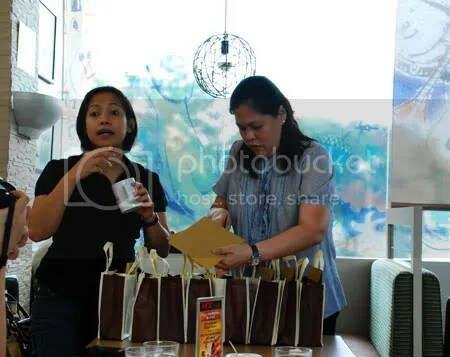 Abbey and Kathleen of UCC prepared the freebies and some notes about the UCC company (press kit tawag ani if press people mi but since dili, notes nalang). Notice the unique lamp(?) decor and the glass windows with designs. UCC Coffee is a Japanese company, but it doesn’t necessarily follow that the restaurant’s decor is Japanese inspired. The place is cozy enough for meetings, especially the space at the upper floor (yep with Wi-Fi access). The prices are not attractive to most teenagers and university students so you can enjoy your coffee in peace. So is it as expensive as I thought? Yes, but not for all products. Others have decent prices considering the sizes of their meals. It can be good for two persons (even para nato, Jeff!). 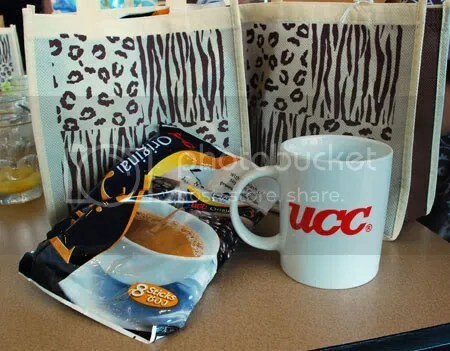 More photos and reviews on UCC products coming up soon. Unsa may lami sa UCC kay plano ko mo adto unya. Daghan Yan haha. Try atung boneless bangus nila, lami to. 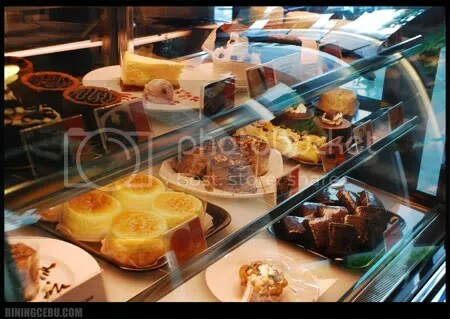 Not sure ug pwede pa to orderon na di naman breakfast. Okay ilang Blue Mountain Coffee, nahan ko, but makakurat ang price (murag mao man yata ni ang Php 359 per cup). Naa pud sila daghan na murag sa ila ra ko kakita na menu. Try lang, unya share pud sa imung feedback. Nahan ko atu mo try mga tea nila. Di man jud layo sa Starbucks price actually ang most sa ilang drinks, ang uban na murag special lang jud kay mao to ang mahal na gyud pud (special = imported). Aw, tanan coffee nila imported diay. whoa.. just realized the flyer..
OMG! 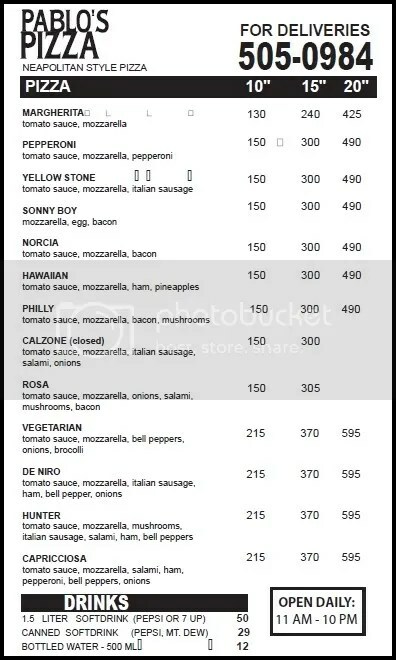 you have the menu for that pizza place some guys over at istorya.net were talking about! COOOL. I’m gonna try it soon. Great ambiance, good drinks, lovely food but the price, quite pricey. My dad and the owner are good friends and he explained naman din that they wanted to serve “hotel-like” quality food but at a cheaper price. 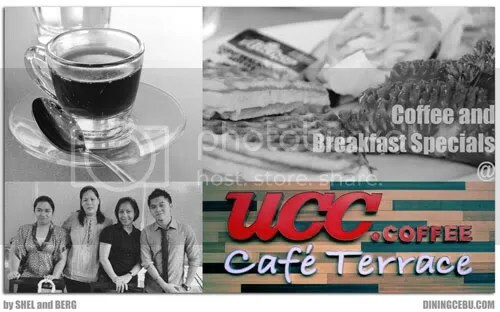 UCC staff are also very knowledgeable with what coffee suits you and your tast although not a coffee lover myself, I haven’t tried their coffee yet and I didn’t get any feedback from my tita who brought a pack if it was as good as they owner said it was. Hi Irene, thanks for dropping by. Lagi, lami man ilang coffee para nako but mahal lang gyud, pwede ra panagsaan para namu nga dili rich ba.